I am so excited that I have been able to join the BundtaMonth group. This group formed out of the love of bundt cakes and, seriously, who doesn't love a good cup of coffee and a slice of bundt cake? It would seem that I joined right at the right time as they are celebrating their anniversary so the theme is "fancy". I look forward to both baking along with the group and getting to know everyone a little better. To be honest I was a little nervous about what I should bake to celebrate this occasion. You know, kind of like the first day of school or a new job where you want to make a good impression and fit in with everyone? Since I had recently purchased a new cookbook, The Australian Women's Weekly 100 Classic Cakes, and I am originally from Australia, I thought it would be fun to see if I could find something there that might work. There were a couple that caught my eye but I finally settled on the Banana-Caramel Bundt Cake. Splitting a bundt into three layers and smothering each one with banana and dulce de leche seemed to suggest a special occasion. If you have not had the pleasure of tasting dulce de leche I suggest you immediately go out and find it, and then try not to just stick your spoon in and eat it straight from the can. Dulce de leche has only recently become available in my area, but if you cannot find it there is a method to make it from a can of condensed milk. One time I even made it without even knowing as I left a can of condensed milk in the back of a warm cupboard and when I opened it I found it had become dulce de leche. The original recipe for this Banana-Caramel Bundt Cake did include whipped cream in the layers too, but I was not intending to eat the cake the same day so I omitted this. After slicing a small piece I will say that I found the cake a little on the dry side. To alleviate this problem I will probably substitute the milk for some buttermilk to see if it can add some moistness to the cake. Other than that it was quite decadent. And don't forget to check out the wonderful "fancy" bundts baked by my fellow BundtaMonth bakers in celebration of our anniversary. In a large bowl place flour, baking soda, and salt and whisk to combine. Set aside. In the bowl of stand mixer fitted with the paddle attachment, beat the butter and sugar until light and fluffy, about 5 minutes. Reduce the speed to low and add the flour mixture in three parts, alternating with the milk in two parts, beginning and ending with the flour. Using a spatula, gently fold in the banana. Pour the batter into the prepared pan and spread it evenly. Rap the pan firmly on the counter to release any air bubbles. Place the pan in the center of the oven and bake until the cake is a deep golden color and a wooden skewer poked in the middle comes out just barely clean, about 50 minutes. Cool in the pan for 5 minutes and then remove and place on a wire rack to cool completely. To assemble the cake thinly slice the banana. Split the cake into three layers and spread the bottom layer of the cake with half of the dulce de leche and top with half of the banana slices. Place the middle layer of the cake on top and repeat with the next layer using the remaining caramel and banana slices. Top with the remaining layer and dust with icing sugar before serving. Recipe slightly adapted from The Australian Women's Weekly 100 Classic Cakes. Holy moly! Look at that cake - absolutely stunning! 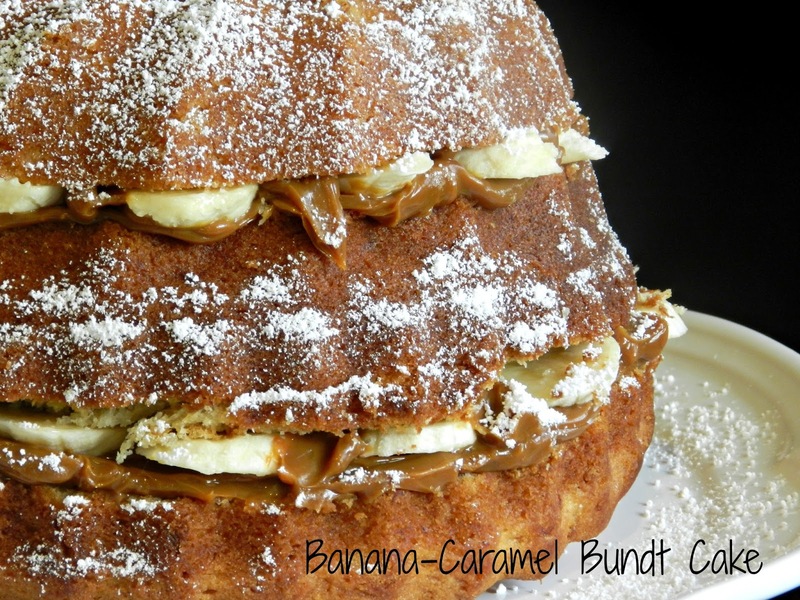 dulce de leche and banana - LOVE the idea! Glad you could join us on our anniversary! Happy bundting, Felice! How neat that you're from Australia, Felice. This layered bundt is incredible. 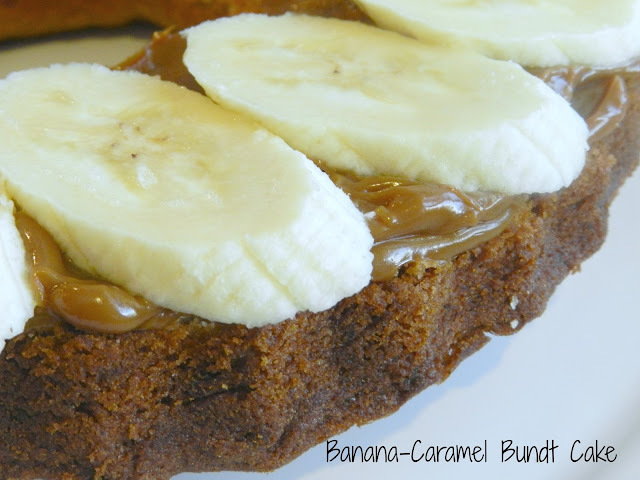 bananas and caramel -oh my goodness, decadent! Thanks for being a part of the group! I'm a major fan of dulce de leche! What a great way to use it and make a nice bundt cake. 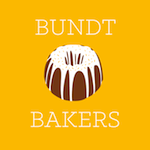 Welcome to the Bundt-A-Month team! Holy moly! That looks amazing! What a perfect way to start and to celebrate. I love how you sliced the cake into layers and added dulce de leche and bananas too. Looks beautiful and must have been delicious. No wonder only the crumbs are left!! I love that last photo, Felice! Perhaps all your posts end that way? I must go check but I think it's great. That's the way most sweets end at my house too! Your cake is fabulous! So glad you could join us this month and your fancy three-layer Bundt cake fit right in! Thanks Stacy. I started ending my posts this way a couple of posts ago as it seemed fitting. What a great recipe and looks super tasty. Hi!! 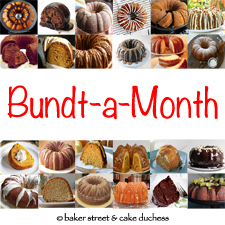 Welcome to Bundt-a-month! You are going to love this baking group! and WOW! Splitting a bundt into three layers and smothering each one with banana and dulce de leche?? I love this. . so decadent and beautiful!! yum! Oh my goodness! Excuse me while I lick my screen! This looks amazing and the flavors sound delicious together!Welcome to the grouup! That looks so very good, I will try and make one. This is seriously delicious! The caramel peeking between the layers is causing massive drooling. I hope you weren't as nervous as I was splitting the bundt. Great job and it's a pleasure to bake with you. I've actually been working the last few weeks to drop a pound or two, but this cake has me positively craving a slice (or two or three)! 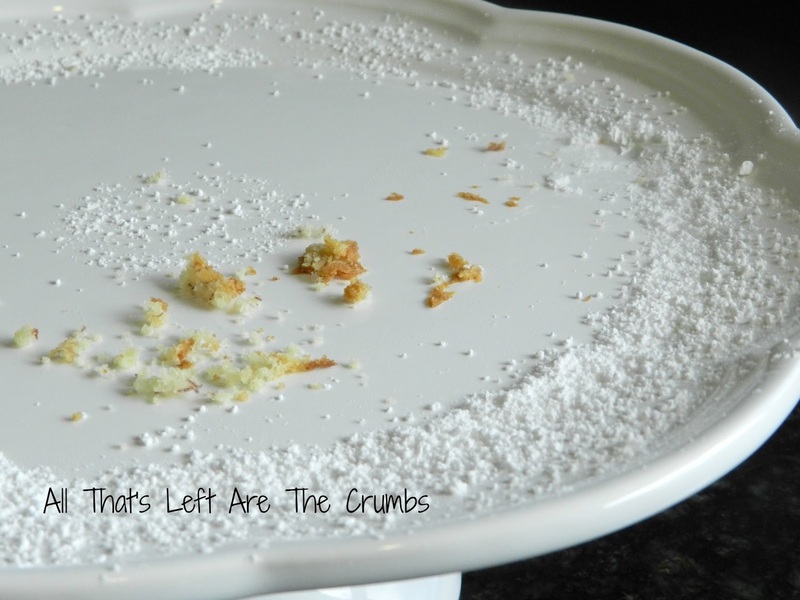 Love the banana on top, but my favorite photos is the one with just the crumbs! That pic says it all! Wowsers you outdid yourself!! I am not a banana fan, but dulce de leche heck yeah. And 2 layers!?!? My hands would have been shaking like crazy the whole time! Gorgeous! G'day and WOW Felice, true! Love the flavor combination and your photo too! I keep going back to this recipe just to gaze at the pictures. I've yet to try the cake out myself but I can't wait to take a stab at it... with my fork.